Silicon Valley And God — Can Churches Solve Local Problems? 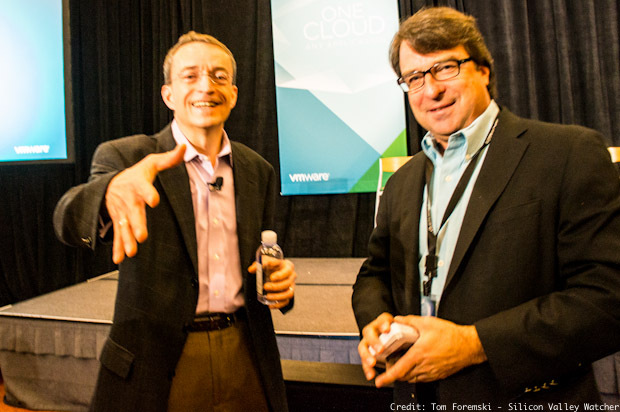 Pat Gelsinger (left) greets SiliconValleyWatcher at a VMware event in February 2015, next to John Furrier of Silicon Angle. The Silicon Valley/San Francisco region has one of the lowest church attendance populations in the US, 30% below the national average. Silicon Valley's culture is often described as Libertarian and heavily influenced by the thoughts of Ayn Rand, an outspoken atheist. But there is room for everyone and in 2015 we might begin to see some signs that Unicorns and a belief in God, are not mutually exclusive. Pat Gelsinger, CEO of VMware, a $6 billion IT giant is emerging as the most fearless and outspoken business leader on the subject of God and religion. He has written two books on the subject of balancing work, family and faith, and he looks upon his work as CEO of VMware as equivalent to that of a full-time minister with his church congregation. Gelsinger noted that the Bay Area is the richest region in the country and the most influential with its emphasis on innovation and high technology. At the same time, the Bay Area ... ranks near the bottom in the U.S. in per capita charitable giving. One of the reasons for the low charitable giving Gelsinger cited is the weakness of the church — often the center of charitable giving in many cultures. Gelsinger noted that, “This area with all its wonderful things, still experiences brokenness.” He cited high crime rates, poor schools, and homelessness that are as bad as or worse than other areas in the country. TBC aims to recruit Silicon Valley business leaders to start talking about religion and God and put aside religious differences to work with local communities in fixing some of the problems. Amplify — to encourage businesses to engage "in service to their communities" and to "see every school with a church-school partnership." Multiply — To multiply the number of churches in Silicon Valley, "From house churches to mega-churches by helping to create a thriving church-planting ecosystem that encourages all types of churches to thrive." Unify — To strengthen relationships between religious organizations and local businesses and civic organizations. Skip Vaccarello writes that Gelsinger and several others were profiled in a recent PBS report titled" Finding God in Silicon Valley." Foremski's Take: Religion and God are subjects rarely discussed in Silicon Valley. Although I'm an atheist I applaud Pat Gelsinger's courage to stand up and try to address the problems the Silicon Valley region faces with its terrible public education and miserly philanthropy. But there are many ways to get to San Jose. Gelsinger's approach is one, but with the very small number of church goers in Silicon Valley there also needs to be a strong secular program aimed at attracting people to the goal of improving philanthropy and solving problems in education and helping improve the quality of life for all. It is embarrassing and shocking that Silicon Valley communities face the same, and sometimes worse problems than in many other US towns and cities. Every country would love to have Silicon Valley's tech companies and our "visionary" CEOs. But if they can't change the very neighborhoods where they live and work, their claims of world changing achievements will be seen as nothing more than hot air — a stinking halitosis of hypocrisy. Where there's a will there's a way. Silicon Valley's problems can be solved without the need to invoke the aid of supernatural entities.